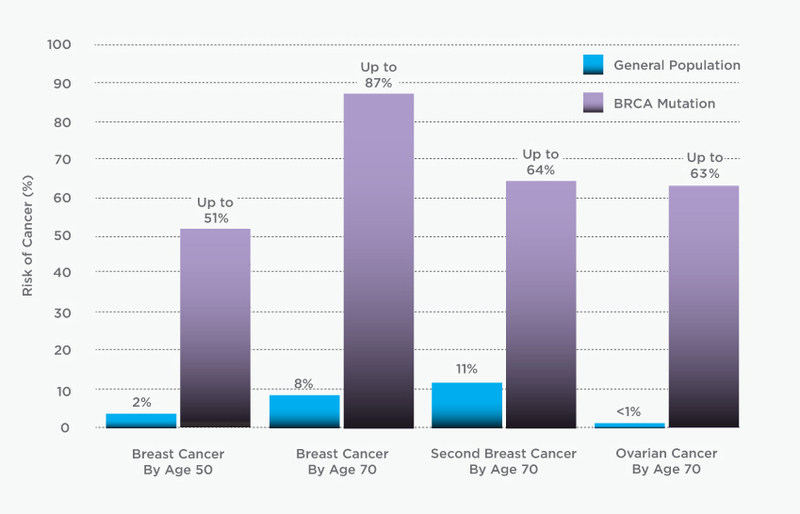 Approximately seven percent of breast cancer cases are caused by mutations in the BRCA1 or BRCA2 genes. People who carry a mutation in either of these genes have a condition called Hereditary Breast and Ovarian Cancer (HBOC) syndrome. They have an up to 87 percent risk of developing breast cancer by age 70. In addition, mutation carriers who have already been diagnosed with cancer have a significantly increased risk of developing a second cancer in the future. In order to assess your risk of carrying a BRCA1, BRCA2 or other gene mutation, your health care professional may ask you questions about your personal and family history. Knowing your medical history helps your health care professional determine whether you might be an appropriate candidate for genetic testing. Genetic testing can provide an accurate assessment of your risk of developing breast and/or ovarian cancer. To help you determine whether you may benefit from genetic testing, take the Myriad Hereditary Cancer Quiz. This quiz can help give you the information you need to discuss your risk of cancer with your health care professional.